Tim first started seriously playing on piano and Hammond organs at the age of 13 years old, when he would sneak into the auditorium of the High School next door to his home in Ottawa, IL. 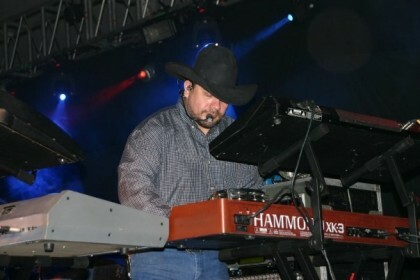 “Firing up that big organ and Leslie and listening to the tone wheels starting up was always fun….because I knew playing it was just moments away” He would practice for 8 hrs a day, trying to emulate the sounds and styles of Elton John, Billy Joel, Stevie Wonder, Dennis DeYoung, Steve Winwood, Billy Preston among many other influences. Huey Lewis and the News, Doobie Brothers, Travis Tritt, Clint Black, Charlie Daniels Band, Sawyer Brown, Chris Ledoux, Terri Clark, Sara Evans, The Temptations, Sugar Ray, Neal McCoy, Keith Urban, Toby Keith, Montgomery Gentry, Trace Adkins, Jo Dee Messina, Jerrod Niemann, Lee Brice, Dierks Bently, Diamond Rio, Zac Brown Band, and many others. “Getting to meet some of my idols and watching them up close and sometimes even from the stage has been the coolest part of my journey” “Watching and meeting players like Taz from CDB, Billy Powell from Skynyrd and Neal Doughty from REO, Sean from Huey Lewis or great women players like Becky Priest (also a Hammond endorsee) from Neal McCoy and even having Jerry Corbetta from Sugarloaf use MY gear for a set and watched him crush “Green Eyed Lady”…it`s been a blast!